Dental treatment with Invisalign is designed to be easy and effective. The clear aligners are removable to allow you to eat and care for your teeth regularly. The following tips will help to create a positive Invisalign experience while you work toward the smile you’ve always wanted. Invisalign aligners are easily removable for your convenience. You should remove your aligners every time you eat or drink to avoid staining or damaging them. Keep them safe in a hard case rather than wrapping them in a napkin, which could be accidentally thrown away. Your aligners should also be removed when you brush and floss. During the rest of the day and night, make sure to wear your aligner. They can be worn while you sleep, work, and play sports or exercise. Wearing your aligners consistently will ensure that your treatment goes as scheduled. Wearing your aligners for less than the dentist-recommended timeframe could slow down your treatment. Aligners that aren’t regularly cared for can become dirty or discolored. Avoid these problems by cleaning your aligner once a day. Talk to your dentist about recommended cleaning methods, as some chemicals may be too harsh for your aligners. Maintaining your aligners will keep them looking their best—which means no one else will see them. It will also protect your dental health by ensuring no bacteria or food gets trapped against your teeth during wear, which could increase your risk for bad breath or tooth decay. Park 56 Dental offers Invisalign treatment to help our patients achieve straighter, healthier smiles. If you’d like to learn more about our wide range of dental services, including general and emergency dentistry, please call our NYC office at (212) 826-2322. 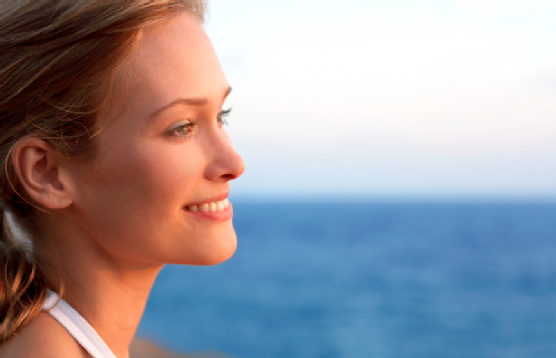 You can find more tips for successful and easy Invisalign treatment on our online blog. Can Your Diet Help to Keep Your Teeth White? Healthy teeth and gums are an important part of your overall wellness. The right diet will not only maintain good dental health, but will also help you keep your teeth looking whiter. This video explains that staying away from foods that would stain a white cloth will keep your teeth stain-free. Avoiding drinks such as red wine, tea, and black coffee prevents discoloration of your smile. You can also drink these beverages through a straw to minimize staining. Other healthy foods for white teeth include menu options rich in calcium, magnesium, and vitamin C.
You can find out more about achieving a whiter, brighter smile from your dentist at Park 56 Dental. 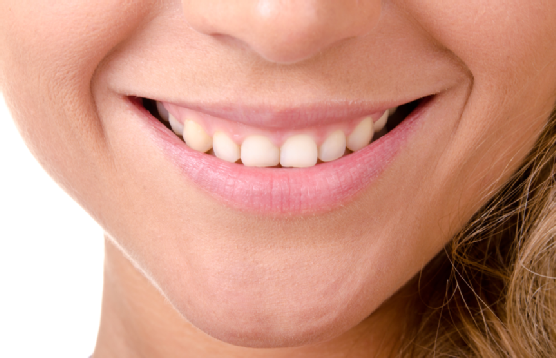 Our top NYC dentists have the answers you need to maintain healthy, beautiful teeth for life. Contact us by calling (212) 826-2322 or clicking on our web contact form. 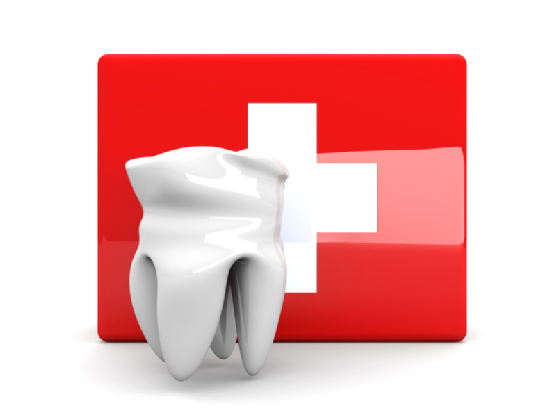 Dental emergencies can occur anywhere and anytime. Knowing what to do in these situations and when to seek emergency dental care can help you to save your smile. Talk to your dentist if you have questions about what to do during an emergency to help you prepare and act quickly. Many people worsen dental problems by ignoring them. Don’t ignore tooth pain in the hopes that it will go away, especially if it is intense and lasting. Pain could indicate any number of dental complications, including a lost filling, tooth infection, or cracked tooth. Schedule an appointment with your dentist as soon as possible if you are experiencing pain or sensitivity from a tooth. Injuries to the soft tissues of your mouth should be addressed even if teeth have not been damaged. Stop any bleeding by pressing a soft towel or gauze to the area. Swelling can be minimized with an ice pack placed against the outside of the cheek over the affected area. If bleeding does not stop, call your dentist or visit an urgent care center. Even after the bleeding stops, contact your dentist for an exam to ensure no damage was incurred where you might not be able to see it. When a tooth is dislodged or knocked out, time is of the essence. Getting to your dentist within half an hour significantly increases the chance that the damaged tooth can be saved rather than replaced. Find the tooth if it has been knocked out and rinse it gently in water—but don’t scrub. Hold it in place in the socket if possible, otherwise place it in a glass of saltwater or milk on your way to the dentist. Park 56 Dental offers emergency dental care in NYC. You can reach us by calling (212) 826-2322 to find out more about how to prepare for an emergency and what course of action to follow. Our website also has more information about general and cosmetic dental care to enhance and maintain your smile. 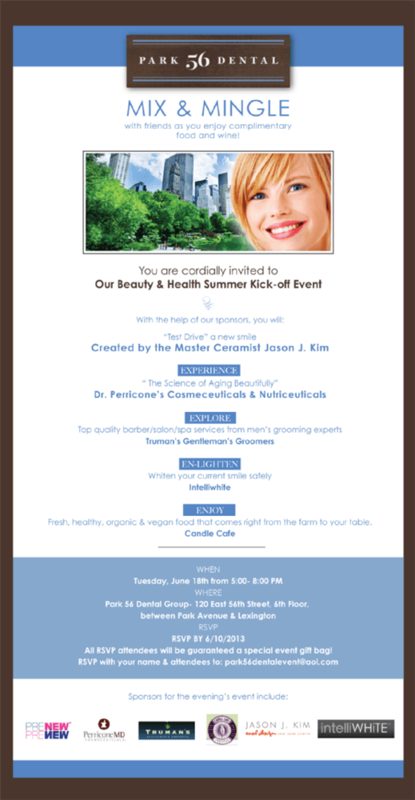 You are cordially invited to our Beauty & Health Summer Kick-off Event! We are excited to announce this summer’s event, a night with friends while drinking wine and eating delicious food courtesy of Candle Cafe. RSVP: RSVP by 6/10/2013 with your name & attendees to: park56dentalevent@aol.com. See flyer below for more details. We hope to see you there! Dental sealants are thin plastic coatings that dentists use to protect teeth from decay. Teeth have small cracks and grooves that are difficult to reach with a toothbrush. To stop food from remaining in these areas and becoming plaque, dentists use sealants to cover the tooth’s surface. Usually sealants are used to prevent tooth decay in children, but adults and young adults can have healthy teeth sealed as well. Sealants are typically good for three to five years, but they are only effective when they are still intact. Call your dentist to have your teeth resealed if you think a sealant has come off or loosened. While in place, sealants are a safe and effective way to protect teeth from decay and prevent cavities. For a dentist in NYC , look no further than Park 56 Dental. We have been offering comprehensive dental services to NYC patients for over 20 years. For more information about preventive dental measures such as sealants, call (212) 826-2322. A strikingly large number of people will be diagnosed with oral cancer each year, but the five-year survival rate is 85% when the cancer is detected early. Risk factors for oral cancer include tobacco use, alcohol use, alcohol-based mouthwash use, and chronic irritation of gums due to other factors. During oral cancer screening exams, your dentist will check for lumps in the mouth, which may be early signs of oral cancer. He or she may also shine a special blue light in your mouth to find cancerous tissue. Under this light, normal tissue appears a different color from damaged tissue. Using this exam, a dentist can see if mouth tissue has changed. To find out more about oral cancer and risk factors, watch this video. Call the top NYC dentists at Park 56 Dental today for an oral cancer screening. We accept almost every insurance provider, and are dedicated to providing a pleasant experience for our patients . Call (212) 826-2322 to find out more.